Western capitals are in quite a pickle those days … years of careful planning and political manoeuvring stand now to be laid waste by Damascus and its army’s blind determination to see gone Daesh militants. Should you have missed recent developments in the Levant, Syrian President Bashar al-Assad went from a pariah head of state to a man with many powerful friendships. Backed by two militarily juggernauts: Russia, and Iran, and the forefather of the axis of Resistance: Hezbollah, Damascus has successfully managed to push back against Daesh and its sisters in terror: al-Nusra, and al-Qaeda and all those other acronyms radicals hide under, to reclaim both their sovereignty, and independence from Western neo-imperialism. While one would have expected Western capitals to be pleased with such positive developments … terror after all, we have been told, is still the West’s enemy number one, both the United Nations and Washington have instead vented anger and disgust at Damascus, arguing war crimes and humanitarianism to avoid hailing Syria’s counter-terror successes. And here we were believing that radicalism was the real obstacle to peace and stability in the Middle East… According to the US we got it wrong. According to the US, only Western planes, and Western-backed militias can, and should defeat Terror – any other efforts can only be labelled as disingenuous and inherently criminal. Sarcasm aside, and PR packaging aside America is in fact fronting such as rationale. Allow me to demonstrate … Ever since Russia entered the Syrian fray last September (2015) – following Damascus request – Syria has successfully capitalized on Moscow’s militarily and intelligence assistance, pushing its troops against Daesh’s bastions. In six months Syria managed to flip the war dynamic to such an extent that Saudi Arabia-sponsored “opposition groups” withdrew from the peace talks. As of May 2016, President Bashar al-Assad stands together a political and military victor – a man whose resilience and determination has been not only vindicated but sealed by his renewed popularity. As the battle for Aleppo is well under way Washington came out with a phantasmagorical tale of human tragedy, and grand betrayal, alleging that President al-Assad organized for the killing of dozens of his own refugees in his pursuit for political control. While such claims makes absolutely no tactical sense … why would Damascus shoot itself in the foot by massacring its own nationals as it faces the deadly fires of radicalism? Washington nevertheless played the news ad nauseam – hoping to generate enough public outrage to justify its paradoxical defense of terror. America is not alone in its psychosis … the United Nations was only too happy to act an echo chamber to America’s lunacy. On May 5th (2016) a refugee camp near Aleppo was attacked in the most odious fashion – leaving dozens of innocent, and unarmed civilians dead or injured. 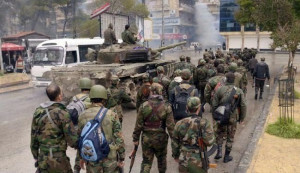 The rampage was immediately blamed on Damascus, courtesy of the so-called Syrian Observatory for Human Rights. While the Observatory hardly qualifies as anything really – the NGO is being ran by a shadowy figure from a two-bedroom flat in Coventry (UK) … a one-man Western propaganda machine, the likes of Washington, the United Nations, and every other mainstream media in town have risen a trusted, and reliable source of information. I wonder how credible the Observatory would be if it was to actually report news and not fiction? How quickly would this organization fall from grace should its narrative hold a mirror to Western imperialism? Note how incredibly graphic Reuters chose to be in covering Aleppo’s massacre against its rebuff of Yemen’s Saudi-run illegal humanitarian blockade, or its silence over Bahrain’s barbaric human rights violations against its Shia community. Damascus had absolutely nothing to do with Aleppo’s massacre. If anything the Syrian Arab Army has pushed beyond anything anyone thought possible so that Aleppo could be freed from the clutches of Daesh militants. It is doing Syria a great dishonour but to sully its spirit of resistance. Here is how RT reported on the news: “Considering the fracture pattern, seen in the pictures and videos taken at the site, the camp could have been shelled, either intentionally or by mistake, by rocket artillery, which is in active use in the area by militants from the terror group Al-Nusra Front,” Major-General Igor Konashenkov, Russian Defense Ministry spokesman, said on Friday. The Russian Defense Ministry states there were no air sorties over the area of the refugee camp on the day of the attack or on the day prior to it. “We have analyzed airspace objective control data for the area as of May 4 and 5, 2016. There were no flights of Russian or any other aircraft over the camp area,” Konashenkov stressed. See the difference here: empirical evidences, not hear-and-say or clumsy propaganda! For five years Syria has withstood the intolerable, the cruel and the most vile. For five years a people has suffered and bled so that it could breathe free once more. The Syrian Arab Army did not murder its own people … Terror did. The same Terror Western capitals have sold you as being moderate, the same Terror Turkey has helped spread so Western capitals cold have at it with their military complex. Can we please remember just how geopolitically important Aleppo truly is for all players? The biggest city in not just Syria but the levant, Aleppo would seal Turkey-Daesh’s hold over northern Syria, and thus offer Radicalism a foothold in the levant which would pave the way for more wars, and more military incursions against Lebanon, Iraq, and even Jordan. “If this obscene attack is found to be a deliberate targeting of a civilian structure, it could amount to a war crime,” O’Brien said in a statement. “I call for an immediate, impartial and independent investigation into this deadly incident,” said United Nations aid chief Stephen O’Brien said. Hail the United States for this grand revelation! Civilian lives are now precious … Too bad such sentiments did not permeate America’s military chain of command in Syria, Afghanistan, Yemen, Libya, and Iraq. I imagine Washington’s memo got lost in translation when drones double-tapped Yemen and Pakistan. Or was it that then civilian lives did not offer an exploitable political angle? Never mind America’s outrage! Washington’s real anger is rooted in Damascus’ successes against Terror – this asymmetrical weapon of war neo-imperialists have wielded over all of our heads. What about we stop playing cat and mouse with the truth?